WHERE IS RUSSIA NOW AND WHERE IS IT GOING? WHAT THE WEST SHOULD DO! There are out in our global landscape so many crises, conflicts, and challenges that it is hard to know which need the most attention and what can be done to deal effectively with each issue we face. One might surmise that America is in a “hard place” in these times of upheavals around the world. I would suggest our readers look first at Russia and ask if they are not in an even harder place in almost every category. The cause of this can be pointed to only one man, namely President Vladimir Putin, who with reckless abandon has positioned his country into the worst possible situation both at home and abroad. For Putin, this has been a time of the “perfect storm,” largely by adherence to an impossible ideology, narrow xenophobic and nationalistic, yes, even fascist policies, and stupid economic policies. He has isolated his country from much of the world and imperiled the security of his nation and that of neighboring countries for little real gain. It is likely that this year and almost surely next will see flat growth or even a real decline in the Russian economy. In Ukraine, he gained Crimea by force of arms when most of that region had not pushed for joining Russia before the invasion of Putin’s thugs. That win will be costly as he must now support a poor region. He invaded Eastern Ukraine and supported hostilities by arming and paying “Russian” forces and separatists who now remain entrenched in battle to this day. This resulted in reinforced sanctions which it is acknowledged even in Russia has hurt key sectors of the Russian economy. All of this could have been avoided as Russia was NOT under any threat from the West. The real danger to Putin was the influence of the Western ideas of democracy, freedom to participate in politics, freedom of the press, and freedom of speech. It was these he feared rather than any invasion or encirclement by the West. Some apologists for Putin think the West caused these acts of aggression by Putin. This is false, rather Putin used and continues to use today this idea along with the lie that the West was “out to get” Russia and hurt it. His real aim was to isolate his citizens from contact with the outside world and real democracy. In fact the idea of the Obama administration of “resetting” our relations was to work with Russia, the opposite of what Putin said the West was trying to do. The initial result was in some cases positive with a series of successful joint assistance and cooperation efforts like the New START treaty, access to transit to Afghanistan, membership in the World Trade Organization, and joint anti-terrorism activities. This should have proved to anyone with an objective view that we were trying the “smart power” and long-term objective of drawing Russia into the wider community of responsible nations. Not to harm it. But this must have been just what Putin feared most. The result now is the disaster zone that is the Russian ruble that recently reached as low as 60 rubles to the dollar and so far an ineffective increase in the bank interest rate up to 17 percent to stop the ruble’s rapid fall. Russian banks closed on Monday, December 15th. Money is flowing out of the country and people are trying to exchange their rubles for dollars or Euros as swiftly as they can. Putin’s actions have led to a decline in Western investment in an economy seen by many as too dangerous and unpredictable. The final blow, which is not Putin’s fault, but which he did not see as a very real possibility was the impact of excess supplies of oil on the global market and a major fall of price, which brought a major decline in income for the Russian state and thereby a lowering of the living standards of the average Russian citizen. So we are now seeing an already marginal economy in a downward spin and impacting the health, education, infrastructure, and investment of the entire nation, but impacting most those at the bottom of the economic ladder. For the West, this is not completely a blessing, but is a mixed outcome. So long as Russian troops remain in Ukraine, sanctions should remain or be selectively reinforced. But we need a long-term strategy to work for a broader engagement with Russia. We need to be seen by the Russian population as being on their side. This positive effort is seen in the recent meeting of Secretary Kerry with the Russian Foreign Minister to discuss relations and cooperation. Western nations are still looking for some kind of “off ramp” for Russia, but two must play this game and not just one. 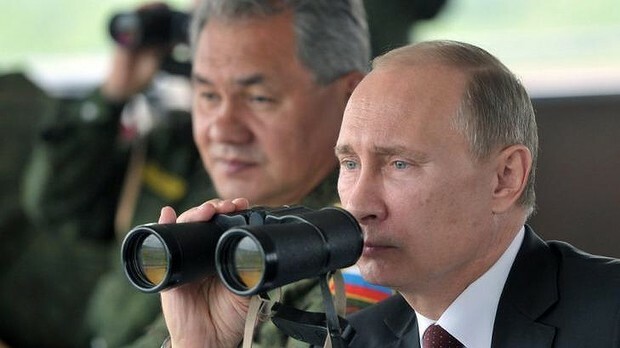 One problem is that Putin seems, as he grows more desperate and angry, to up the level of confrontation with the West, such as, the many provocative and dangerous military missions of planes and ships into Western borders and nations. Also, Russian military movement along the Baltic region also indicates weakness not strength, in risking for little gain added military confrontation with uncalculated danger of missteps and of escalation. There may come a point when Putin or a successor sees the futility of a pure confrontation approach and finally comes to see Russia’s future as part of an integrated, prosperous, and responsible community. The Russian people and its leaders will at some point need to realize that Putin has put them into a very dark and confined box and will want to break out of that cold and ruthless authoritarian place he has put them in. America and the West need to be prepared for that day and start now to show our concern and hold out some carrots as well as sticks. See our 2016 Election Quotes section. Next Article HISTORIC OBAMA EXECUTIVE ACTION: CUBA COMES OUT OF THE COLD AS DOES OUR POLICIES! JUDGING by the lack of economic news in Russia’s media, a crisis has arrived. Just as in Soviet days, state television does not report facts, it conceals them. The official picture is dominated by the war in Ukraine (fuelled by America), Ukraine’s economic collapse (ignored by America) and Russia’s achievements in sport, ballet and other spheres (envied by America). But whereas television does not mention the economy, ordinary Russians have been busily changing roubles into dollars, buying anything that has not gone up in price and making contingency plans. In the first two weeks of the year, when Russia was on holiday, the rouble fell by 17.5% against the dollar. Inflation is up into double figures. The price of oil, Russia’s main export, has slid below $50 a barrel, prompting economists to revise their forecasts down. GDP is now expected to contract by between 3% and 5% this year. Russia’s credit rating is moving inexorably towards junk. The government’s Zen-like calm betrays a lack of strategy. Russia’s president, Vladimir Putin, is shown on television receiving positive reports from regional governors. Yet the fall in oil prices to below $50 a barrel will cost the state budget, which was calculated on the basis of $100 a barrel, 3 trillion roubles ($45 billion), or 20% of planned revenues, according to Anton Siluanov, the finance minister. He was already planning to lop 10% off the budget, but may now have to cut further. Even if pensions and salaries are raised by 5%, double-digit inflation means that real incomes will decline for the first time since Mr Putin came to power in 2000. The Kremlin hopes to ride out the crisis, as it did in 2008-09 when GDP contracted by 7.5%. Then the government was able to stimulate demand by increasing public spending and saving indebted firms. It no longer has that option. Russia’s reserves are lower than they were four years ago and may last only for a year and a half, at best. Worse, the government has lost credibility. An increase in interest rates to 17% in December was intended to defend the rouble, but it has not worked. Russians have lost faith in the currency and are starting to withdraw deposits……… . The rouble’s fall would have been even greater had it not been for the Kremlin telling exporters to sell foreign-currency revenues while also warning large firms not to buy. Yet whatever liquidity the Central Bank supplies to Russian banks, the money finds its way into the foreign-currency market, putting more pressure on the rouble. Any injection of liquidity may thus end up not stimulating domestic demand but merely increasing capital outflows. The only way to support the rouble is to limit the provision of liquidity to banks; but that in turn would put banks under pressure. …….. This analysis reinforces the serious economic and therefore the serious domestic political consequences as well. Perhaps with some signals that the reality of this downward slide is starting to have its impact at the top, it is time for Russia and the West to consider the so-called “Off-Ramp” and this needs to start in the Eastern Ukraine to permit that conflict ridden region to regain its integration back into the larger Ukrainian society and gain a significant degree of self-rule. Russia then can see much of the sanctions reduced or eliminated but with the understanding that recent acts of belligerence and military provocation will stop. The West then can enter into a serious set of negotiations to provide meaningful agreements and cooperation that will end with a “win-win” for both sides. Putin then has the option of either initiating a program of some real economic and political reform including thus growing his economy and helping its poor and perhaps even permitting a degree of free speech, press, and democratic governance. Just the opposite! I am a strong opponent of much of the “military-industrial complex” and their push for useless weapons…..but I am also opposed to the Russian squadding of its resources on largely useless or dangerous military spending. And on our own. I recommend the New York Times editorial today to you on this topic “ A Vital Nuclear Agreement, at Risk.” It shows how Russia seems to revert to the old Soviet bad habits. I know Russia both 40 years ago and Russia today. I recommend to you the data of the World Bank, WHO, OECD, and a host of other sources about the backwardness of the average and poorer Russian today and especially away from the center cities. The FT has reported on its negative growth. Some clearly have it better, but listen to the reliable reporting of the harshness of life for an average citizen and his/her family and you know the reality. I was a graduate student of George Kennan and the renown Professor Frederick C Barghoorn a Soviet expert and writer on Soviet nationalities and the Communist Party history, and studied Russia rather intensively in the late 1970s-80’s and beyond. I served as a senior officer at the US NATO Mission which included looking at Soviet economic and military industries. I have followed Russian politics, security policy, and economy since closely. Of course you are right things are better in some ways, but it is largely for the elite life is much better, there are new buildings in Moscow, better restaurants, fancy cars, better housing, around Moscow and other center cities, but these are all beyond the reach of the average Russian. And it will be worse given what Putin has done to undermine the Russian economy. I stand by the view that it is Putin and not the West that is to blame for much of the current sad breakdown in Russian and Western cooperation. The Russian invasion of Ukraine and Crimea is inexcusable. I have supported strongly for decades a strong policy of engagement with Russia. But as I have said, it takes two to tango. We have in both Russia and the United States elements, especially with the respective Right wings of each side, including in the Russian military, that want to create conflict for their own myopic and selfish reasons. But as you will note in my posts, and in my FT Letter of Jan. 2, 2014, I said we still must have a policy of engagement and working to bring Russia into the community of responsible states even as it continues to go into very dark places of danger to itself and others. Again thank you for your comments and long work in public service in you great country. I read your letter in the FT. As retired Chairman of the Senate of Canada Standing Committee where I presided for many years, I know Russia well. I didn’t recognize it from your letter which describes a Russia of 15 years ago. I read the article in Harper’s magazine, yesterday, about the roll of the US arms industry in the breakdown of relations between Russia and NATO in particular. I spent more than 38 years in Parliament. So I am quite experienced. Before that, as a young man I was with the French in Algeria. Is your letter your opinion of the Russian standard of living, which as I say, is 15 years out of date, or the opinion of interested parties in defense lobbying?